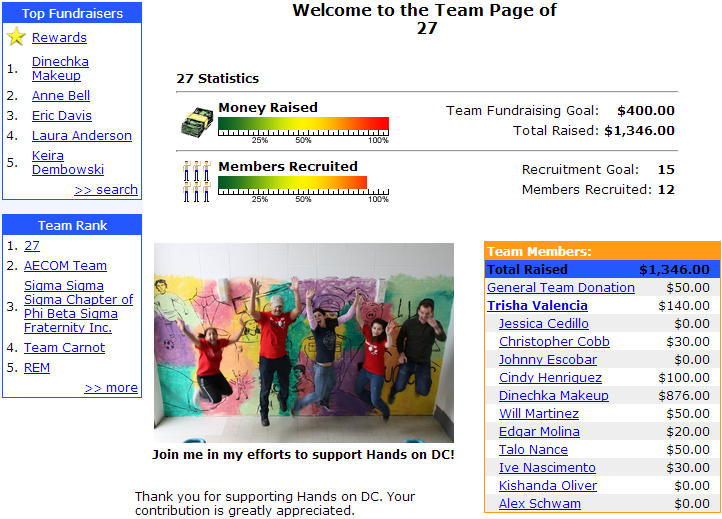 On May 19, 2012 our team “27″ (to celebrate Trisha’s birthday) including Trisha, Ive, and I were assigned to a DC elementary school for Hands on DC to help clean up the school and to support public schools in the DMV area. The Charity event was a huge success! We were able to raise $1,346 to contribute to restoring the DC public schools and ended up being the top ranked team for the event. Ryan Lai of Push to S.T.A.R.T. Hands on DC’s biggest event is a one-day Work-a-thon held every spring. During the Work-a-thon, approximately 2,000 volunteers spend the day at one of about 30 DC public schools. Their work typically involves projects such as painting, cleaning, or landscaping. Other projects require greater skills and resources, such as repairing bathrooms, laying carpet, building tree boxes or wiring classrooms for Internet access. Creating a better environment for learning is just one of the ways volunteers help local students. They also raise money to fund college scholarships administered by local tutoring and mentoring organizations, and they learn about the condition of and the people involved in the schools. That knowledge helps build support for public education.